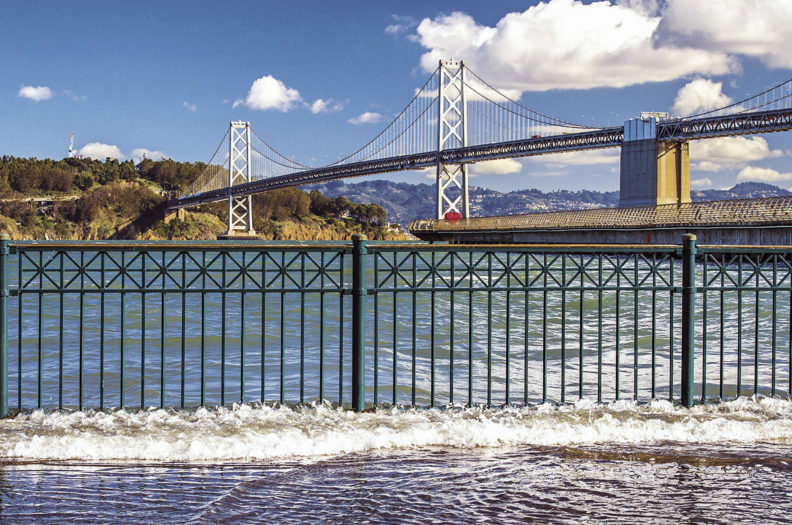 In San Francisco’s Embarcadero district, king tides caused flooding between Mission and Howard Street last winter. When the tides are high in parts of San Francisco, Charleston, and Miami, city streets experience an odd new kind of flooding that happens even on bright, sunny days. In San Francisco’s Embarcadero district, king tides caused flooding between Mission and Howard Street last winter. Seattle’s Georgetown and South Park neighborhoods have experienced sewer back-ups into streets and basements after large storms. These are quite literally waves of the future, confronted by Hope Hui Rising and her students at Washington State University. They are working on the front lines of sea level rise, developing urban design strategies to help communities adapt. As the oceans warm due to climate change, they expand in volume—just like the mercury in a thermometer expands as it warms. Add melting from distant, frozen landscapes in Greenland and Antarctica to the thermal expansion, and the seas will rise. Unfortunately, much of civilization lives along the world’s low-lying coastlines. Researchers also predict more frequent, intense storms, which could overwhelm urban infrastructure. Very little funding exists for proactive adaptation planning or for holistic urban design strategies for a problem that promises to affect millions in the next century. Rising, an assistant professor in the WSU School of Design and Construction, is a petite, constantly moving, whirlwind dynamo. 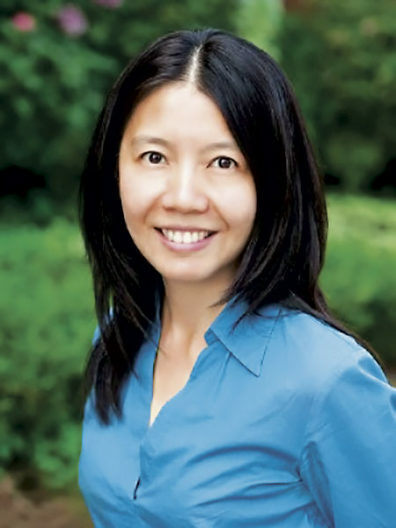 She started the WSU Adaptive Water Urbanism Initiative, a program that aims to bring research in climate adaptation to communities in need, while providing hands-on education to students and to those who will be affected by sea level rise. This program of design, research, and outreach is unique in the country, allowing students to work side by side with professionals and city experts who are leaders in resiliency, adaptation, and mitigation. Earlier this year, Rising and students in landscape architecture, civil engineering, and environmental sciences held community meetings in San Francisco neighborhoods, inviting youth, community members, city staff, and professionals to participate. The students led workshops and facilitated games to develop design alternatives. Throughout the semester, the students collaborated with planning and engineering experts. In May, they presented their ideas to San Francisco Public Works officials. Throughout the project, Rising incorporated her research into the classroom while giving the students freedom to design solutions for communities at risk. The students poured their energy into the work, putting in extra hours and far exceeding the course requirements. “They really care about this work,” she says. The students developed several ideas, including a master plan for coastal resiliency for San Francisco’s east side that would enhance the city and bay’s biodiversity while building long-term resiliency along the coast. 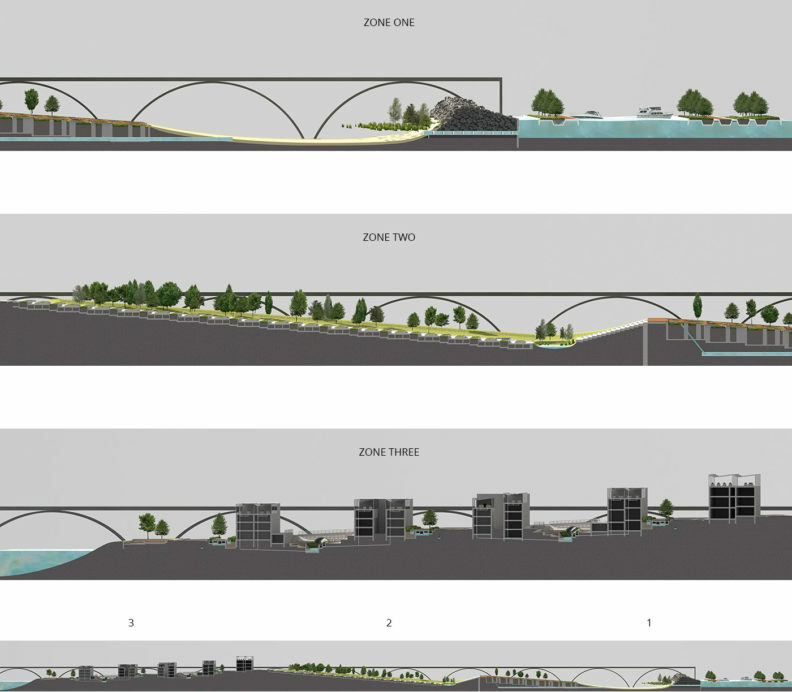 Other projects focused on site-specific designs to address recurrent flooding for the Embarcadero, the neighborhoods between Mission Creek and Islais Creek, and the Green Benefit District of Dogpatch and Northwest Potrero Hill. Seeberger says he has enjoyed the challenge that combines design and problem-solving to develop solutions for the environment. Rising and her group continue to work with Seattle and San Francisco communities while responding to new requests on the West Coast and in Asia. Their work will also be used by the city of San Francisco to help inform a yearlong design challenge on resiliency solutions.